Sukosol Hotels, led by owner and president Khun Kamala Sukosol, has long been synonymous with charity work in the Land of Smiles. Besides putting on regular charity concerts, art exhibitions and other fundraising events, the hotel group’s various efforts support a range of causes, including the Ramathibodi Foundation's Liver Transplant from Parent-to-Child Program, the Chulalongkorn Craniofacial Centre and Friends of the Asian Elephant Foundation (FAE). Not to mention that they help out respected international aid organisations like the Thai Red Cross and UNICEF on an ad hoc basis. Some of our CSR and charitable endeavours are outlined below. From 12–16 November 2012 The Sukosol was pleased to open its doors and welcome 19-year-old Khun Jannakron (Outlet Manager) and 28-year-old Khun May (Kitchen Manager) from the Urban Neighbours of Hope (UNOH) organisation to its Bakery Cafe to learn about restaurant management and basic food preparations skills. The happy pair spent a productive week in our kitchen learning first-hand from our skilled staff how to take orders, serve customers and prepare delicious, fresh food like salads and sandwiches, not to mention the perfect cup of coffee! The two young entrepreneurs will soon manage their own cafe, Munjai (meaning ‘confidence’), in Bangkok’s underprivileged Klong Toey slum, which is home to 160,000 disadvantaged people living in just 13 sq.km of land. Their hope is to help raise the basic living standards of the local youth population (who might otherwise get involved with drugs, crime, unemployment, etc) by providing meaningful part-time employment and training opportunities. This lofty ambition is echoed in the cafe’s slogan: growing confidence with every cup. Other UNOH initiatives include a fair-trade handicraft co-operative, kids’ art/sport program and cooking school, out of which the book “Cooking With Poo” has become phenomenally successful, with renowned international chef Jamie Oliver and Australian Prime Minister Julie Gillard being fans. On Saturday, 23 June 2012, over 60 staff members, ranging from management to operations, from The Sukosol, Bangkok, went to Wat Santigaram School in Ratchaburi Province west of the capital to take part in a fun and productive Corporate Social Responsibility (CSR) initiative. The Sukosol hotel is committed to engaging in positive community engagement and environmental conservation, evidenced by its four-leaf status in the Green Leaf Foundation (GLF). 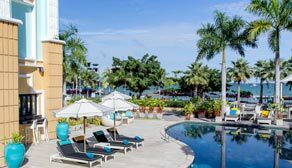 Annually the hotel holds CSR and ‘going green’ trips to areas surrounding Bangkok to initiate and oversee a range of activities, such as beach clean-ups and hygiene seminars. For this particular project the group visited the school to assistant with tree planting within the school grounds, to build a waste separation collection point (now a model project for the local community), play games and interact with the students and donate much-needed school supplies, such as stationary, sporting equipment and books. The Bayview warmly welcomed 20 young blind children, aged 7 to 14, from The Pattaya Redemptorist School for Blind Children to the award-winning property in downtown Pattaya on 23 May 2012. The hotel provided the group with free accommodation, fun and educational activities and a celebratory dinner organised in conjunction with the Tourism Authority of Thailand (TAT) and Ya-hea magazine, a free Braille publication in Thai and English. This unique CSR initiative was part of Sukosol Hotels’ commitment to helping society’s less privileged children by offering them an unforgettable field trip and helping them improve their social skills. The Pattaya Redemptorist School for Blind Children was founded after a young blind child was left at The Pattaya Orphanage. As there was not currently a local school specialising in such special needs, the orphanage’s patron, Father Ray, opened the school in 1986. Nowadays there are eleven such schools for blind children across the Kingdom of Thailand. The Pattaya chapter was founded with the help of Mrs Aurora Sribuapan, a renowned social worker who is herself blind and is now the school principal. With over 170 students boarding and studying for free, the school really is a life-saving haven for the lucky few. Sukosol Hotels, part of the Sukosol Group, joined hands with the Thai Red Cross Society and UNICEF in December 2011 to provide emergency help and support for flood victims in Thailand through the donation of Baht 1.4 million in much-needed funds. The money was given to the Thai Red Cross Society’s Relief Communities Help Bureau to provide assistance to individuals and families affected by disaster, mobile hospitals to take care of physical and emotional rehabilitation needs and vocational training and community morale improvement. Sukosol Hotels’ efforts to raise funds and awareness about the catastrophic flooding included the selling of a “Sukosol family” collaborative CD, entitled L-O-V-E. It was available at the group’s Bangkok and Pattaya hotels, with all proceeds, approximately Baht 10,000, going to the Red Cross Society’s Flood Relief Fund. The group’s large Bangkok property, The Sukosol, also took it upon it itself to provide free on-site accommodation, parking and food for its most badly affected staff. In addition, 67 employees indentified as being “in extreme need” were donated Baht 4,000 towards repairing their home and Baht 70,000 was used to buy them paint, brushes, cleaning materials, etc. Staffs are also eligible for a loan initiative program enabling them to borrow up to Baht 50,000 at a minimal interest rate. Make your reservation through our website for exclusive benefits. Indulge in a romantic getaway at The Sukosol and receive a complimentary bottle of sparkling wine and dinner for two.